I am the author of three books. If you have any questions about any of my books, please feel free to Contact Me. Becoming Buddha – Becoming Awakened is my most recent book and is a comprehensive presentation of an awakened human being’s teachings on doing the same. The Truth Of Happiness is a ten-week personal Dhamma Study and companion guide to Becoming Buddha. The Spiritual Solution is for those in the recovery and 12-Step community. Becoming Buddha is a comprehensive and easily understood presentation of the direct teachings of an awakened human being. My purpose in writing Becoming Buddha is to provide clarity and consistency about what the Buddha actually taught, and his direct path to becoming awakened, to Becoming Buddha. Throughout this book I occasionally make note of the differences and contradictions between the Buddha’s teachings, as preserved in the Sutta Pitaka, and what has developed since the Buddha’s passing. This is necessary for clarity, consistency, contextual relevancy, for respect to an awakened human being, Siddartha Gotama, and his Dhamma. I have found no useful or practical reason to alter or adapt the teachings of an awakened human being. Doing so has led to often ineffective and confusing modern Buddhist practices inaccessible to many who would hope to develop understanding. Becoming Buddha clearly explains the remarkable story of the preservation of the Buddha’s teachings in the Sutta Pitaka, the second book of the Pali Canon. The chapter on the Pali Canon shows how the many adaptations and accommodations began at the Second Buddhist Council approximately 100 years after the Buddha’s passing. These adaptations and accommodations have continued for 2,600 years through cultural influences and charismatic individuals. Becoming Buddha cites and explains twenty-three suttas. Following the Introduction and the chapter on the Pali Canon is an explanation of Three Marks Of Existence – Impermanence, The Not-Self Characteristic, and resulting stress – Dukkha. The next chapter follows with the Nagara Sutta, a remarkable accounting of Siddhartha Gotama’s own awakening – Becoming Buddha – and what he awakened to: Dependent Origination. This often misunderstood and misapplied fundamental understanding formed the basis for his very first discourse on Four Noble Truths. 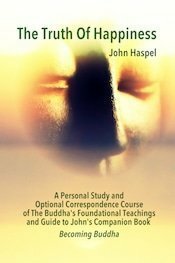 Everything the Buddha taught during his forty-five-year teaching career was taught in the context of Four Noble Truths in order to become empty of ignorance of these Four Truths and end the confusion, deluded thinking, and ongoing unsatisfactory experiences that are dependent for origination in this initial ignorance. The Truth of Happiness is a companion book to Becoming Buddha and a ten-week personal Dhamma study of the direct teachings of the Buddha. Developing the Buddha’s Dhamma free of the confusing and often contradictory modern Buddhist practices will develop a realistic foundation for a useful and effective meditation and mindfulness practice as taught by an awakened human being. Included are links to Dhamma talks by the author relevant to each week’s study. There is an option to study with the author through weekly emails and phone contact. Here is a link with information about the Truth Of Happiness Correspondence Course. The Spiritual Solution is for those in the 12 Step Community. The Spiritual Solution is a simple guide to the 12 steps as originally presented in the book Alcoholics Anonymous. This book is used at my 12 Step Workshops. Support John With Your Donation >> Thank You!